Papers: In the Yates Family Papers, 1789-1936, 14.9 linear feet. 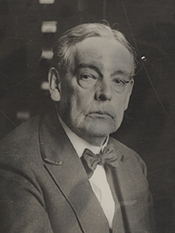 The Yates Family Papers contain correspondence, scrapbooks, writings, genealogical material primarily concerning his family history and literary endeavors. The papers are organized into three series: I. Richard Yates, Sr.,1789-1873; II. Richard Yates, Jr., 1874-1936; III. Bound Volumes, 1837-1927. Items relating to Richard Yates include some scrapbooks concerning his congressional years, an autobiography (undated, 301 pages), and gubernatorial photographs. A finding aid is available in the repository. Papers: In the John Dean Gillett Oglesby Papers, 1878-1938, 16.38 linear feet. Persons represented include Richard Yates. Papers: In the George Pasfield Scrapbook, 1834-1912, 1 volume. Papers: In the Frederick Rowe Scrapbooks, 1888-1937, 1.96 linear feet.